I could sit ‘ere an’ drink it in all day is an expression that comes to mind as I think on Yorkshire Day (August 1st) about my roots in the moors and Dales of Yorkshire….and good Yorkshire ale! This year it comes just a few days after the fabulous hosting of the opening two stages of the Tour de France (TdF). We were joined at our Stage 2 front garden view in Haworth by James and friends, cycling fans up from London. Coming up Main Street was clearly thirsty work for them and finding no bottle opener in the saddle bag, they innovated with a cycling shoe. A perfect spanner for the works! The TdF inspired some new beers in Yorkshire. 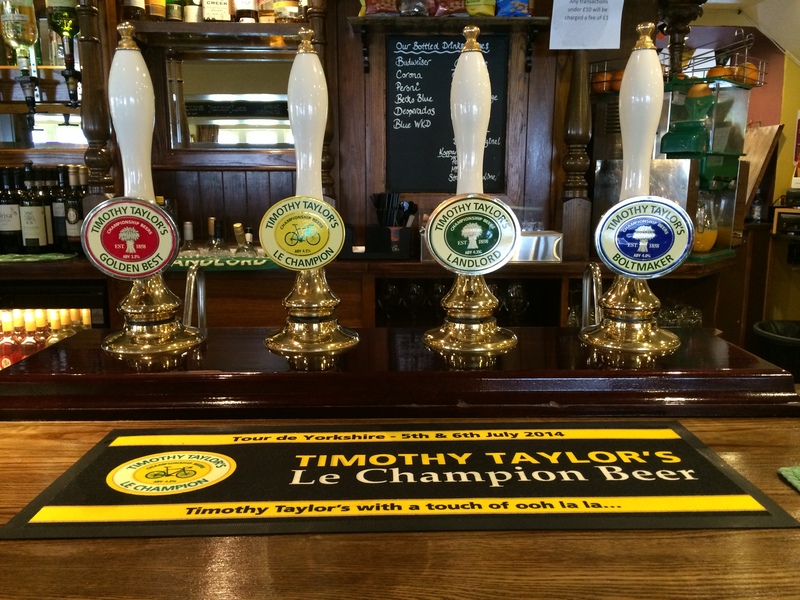 Timothy Taylor’s Knowle Spring Brewery in Keighley went with Le Champion, a French-style blonde beer brewed with Alsace Strisselspalt hops and continental malts. The result was a smooth, light taste, slightly stronger than the four times CAMRA Championship-winning Landlord. Perfect for a hot day in the saddle! Goose Eye Brewery crafted Maillot Jaune, a summer brew set at 4.2 per cent. The barrel was swiftly served up by Gary and dispensed of in no time at the Haworth Cricket Club located alongside the Stage 2 route. A real “Yellow Jersey” of a beer. Two other locals, which, regret to say, I didn’t get the chance to quaff were mashed up for thirsty cycling fans along the route: Saddle Sore, coming out of Naylors Brewery in Cross Hills and On yer Bike, made close to the now famous Cote de Oxenhope Moor by Bridgehouse Brewery. Cheers and here’s to bikes and beers in Yorkshire.